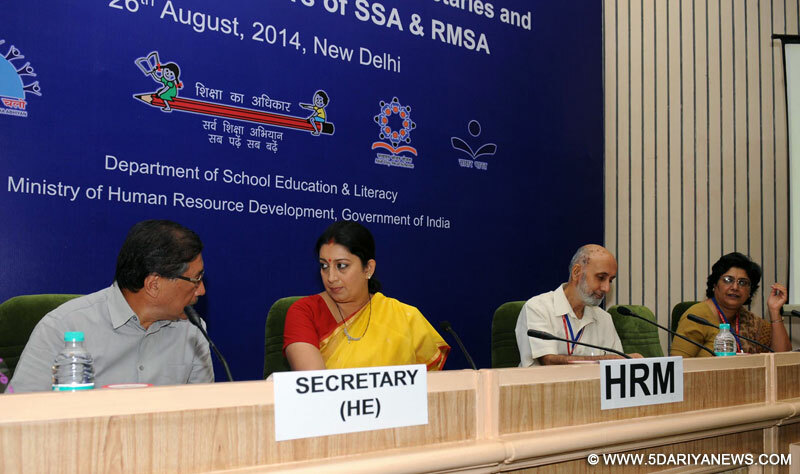 The Union Minister for Human Resource Development, Smriti Irani at the inauguration of the Conference of State Education Secretaries, in New Delhi on August 26, 2014. Human Resource Development (HRD) Minister Smriti Irani Tuesday launched the "Padhe Bharat Badhe Bharat" programme which focuses on early reading, writing and comprehension and early grade mathematics for young children.The programme was launched at the day-long conference of state education secretaries held here.Smriti Irani requested all states to roll out the programme with a "strong resolve" so children in early grades acquire proficiency in writing, reading and comprehension that will "enable them to progress to higher classes...". "...In the area of inclusive education, substantive focus is being given on curricular adaptations for children with special needs and assessment adaptations. Assisting teachers in teaching such children...was the other document released," Rajarshi Bhattacharya, secretary, department of school education and literacy, told the media. He was referring to a publication titled "Including Children with Special Needs -- Primary Stage" on curriculum adaptation development brought out by the NCERT which was also launched here.He added that a revived website for the Rashtriya Madhyamik Shiksha Abhiyan (RMSA) was also launched for wider public awareness of the programme.Irani also stressed on the need for improving the quality of schools which she said was still a "challenge" and sought the cooperation of states in improving school education.While noting the absence of toilets, Irani also requested states to prepare an action plan for their construction in all government schools by July 2015 so the vision of Prime Minister Narendra Modi becomes a reality.She appealed to the states and union territories to pay special attention to girls' education and create an enabling environment for them to enrol and complete their education, while referring to the government's "Beti Bachao Beti Padhao Abhiyan". Bhattacharya added that discussions were also held on the necessity to make schools the central base in the village community network and "to that extent celebrating school foundation day which has been termed 'Shala Utsav' so as to encourage community participation and honouring teachers in schools".He said of the 247 universities in the country, only 69 have revised their teacher education curriculum based on the National Curriculum Framework, 2009 during the past five years. "...This revised curriculum is of immense necessity because it focuses on the critical needs of the first generation learners, the persity of the classrooms and also focuses on the ability to construct critical thinking...," he said.